Joe Brown was born in Baton Rouge, Louisiana, officially on 18 may 1926, but possibly a year earlier. He was the son of a carpenter, August Brown, who was deacon of the local Baptist church and also according to his son something of a rascal. Joe had two sisters, Violet and Velma, and a half sister Geraldine. A pupil at McKinley High School he played football, baseball, basketball and aged 14 also did some boxing. He said “I learned on my own, I was just a natural fighter”. When he left school he did some carpentry and then some car body work to earn a living, but mostly he was a boxer first and a labourer second. Aged 17 he made his pro debut, a four round points win against a Puerto Rican lightweight, Leonard Caesar in New Orleans. He then joined the US Navy and did not have another pro fight for more than two years. He did win an inter services championship but his time out of the ring showed when he resumed his career. In January 1946 he lost a five round decision against Caesar who he fought twice more in the following two months, with Brown coming out ahead with two wins to one, with one draw. Brown was managed by Lester Majoue and Louis Chattard and the made certain he fought regularly. His fast hands and feet kept him away from too much trouble, which was fortunate as he was not much of a puncher to start with. He was to develop this as he got older. After an 8 round decision against Bob Weatherly, Brown took on Tyler again and on this occasion held him to a draw in March 1947. Brown was matched with another rising star, Jimmy Carter in April 1947 which he won on points. Carter went on to become world lightweight champion three times during the 1950’s. However he was pushed to far when matched with Sandy Sadler who stopped him in the third round. Brown took a two month break and came back to outpoint Bartholomew and lose just once in the eight fights before the end of that year. He went to Montreal where he outpointed Danny Webb and lost a decision against Arthur King, who he had previously outpointed, in Toronto. Brown, despondent at his lack of recognition, went through a bad patch lasting for most of 1948. He turned his career round in 1949 when he went to Chicago and was unbeaten in eight fights and a draw against John “Twin” La Broi. In 1950 he went to Australia as chief sparring partner for Freddie Dawson and had a few bouts himself and returned unbeaten after four contests. At the end of 1952 he ended his partnership with Majoue and Chattard and signed for Lou Viscusi. “I never seemed to get anywhere, I was the number one draw in new Orleans but if I made $1,500 I was lucky”. Eight years later the Kefauver Committee, which investigated mob involvement in boxing, revealed Viscusi was a front man for the infamous gangster Frankie Carbo. Brown began 1952 with three fights against welterweight Walter Haines, the first two ending level with Brown getting the better of him in the third contest. 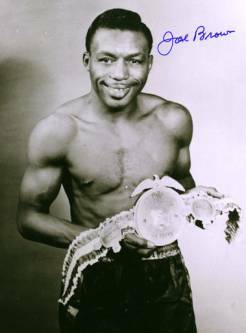 He floored jerry Turner twice before stopping him in and then outpointed Mel Bartholemew and Jimmy “Bud” Taylor. He made his New York debut in October 1952 against George Araujo. George was slightly ahead on points after six dull rounds before he put Brown down for the count.”I froze” said Brown “I thought that would be the end of any hopes for me, but a fellow needs to earn a living”. In 1954 he took in a tour of Panama, stopping Federico Plummer in eight and the Panamanian champion Wilfredo Brown in four. He was asked back the following year for four more fights all of which he won. In 1956. brown had been outpointed by him the previous year and it looked that it was going the same way when he was knocked down early in the fight.However he fought back to score a ninth round stoppage. “It was my toughest fight – it was also the turning point” said Brown. In may 1956 Brown was matched with the title holder Wallace “Bud” Smith in a ten round non title bout. Brown outpointed Smith and Viscusi, never one to miss an opportunity, negotiated a return fight with title at stake in New Orleans. It took place in August 1956 with Brown getting of to a dreadful start by breaking his right hand in the second round. However he managed to keep control of the fight and floored the champ in the 14th round. At the bell one of the judges, Frederick Adams scored it 9-3-3 for Brown and the referee Ronald Brown had it 12-3 for the challenger. Smith acknowledged the verdict was fair “I just couldn’t get going” “ He made me miss many punches I should have landed”. Brown loved being world champion. He was a celebrity with people asking for his autograph when he was walking along the street. His broken hand meant a six month layoff but once healed he kept to his commitment of a rematch with Smith in Feb 1957 at Miami Beach. Victory at the end of the 10th confirmed his superiority over Smith who went on to lose his next six fights before he retired. Joe returned to the ring with a non title win against Armand Savoi in March 1957 and then defended his lightweight crown against Orlando Zulueta in June.Foe 12 rounds it was close until Brown knocked Zuleta down with a left hook in the closing seconds of the 13th round.When he got up at nine the bell rang. Zuleta survived the 14th but not the last. He was rescued with only 21 seconds on the clock. Some said the stoppage was premature but Brown’s reply was “Why risk a fatality”. Three more non title fights followed as he cashed in whenever and wherever he could. He boxed so badly when Joey Lopez held him to a draw in Chicago that Viscusi gave Lopez a return for the title again in Chicago , December 1957. Brown won in the 11th after Lopez was so confused at the end of the 10th he sat down on Brown’s stool. Two knockdowns brought Lopez’s second, Johnny Ceniceros, rushing across to stop the fight. His 3rd title defence was back to the non title circuit as Viscusi set about finding a more financially rewarding deal for the 4th defence. Brown had contests in Washington and Havana but these were little more than exhibitions. His next defence was finally arranged against Ralph Dupas in May 1958. Dupas was a 22 year old with seven years pro experience behind him. The combination was insufficient as brown stopped him in the 8th. The Michigan southpaw Kenny Lane was the next challenger in July 1958 when Brown retained his title with a unanimous verdict. Ringside reporters felt the decision was fair, while Brown admitted later he hated having to box southpaws “ lefties are a pest to mankind” he joked. Brown ended 1958 with a disappointing non title 10 rounder against Johnny Busso who out pointed him in Miami Beach.The man the press had started calling “Old Bones” took a rare rest of four months before his next defence, an eight round win over the New York based Italian Paolo Rosi in Washington DC. Rossi was unable to continue because he was so badly cut over both eyes. Brown waited six months before putting his crown on the line against Britains Dave Charnley in Dec 1959 who was to retire after 5 rounds due to a cut over his right eye. Brown took life a bit easier in 1960. A body assault from Ray Portilla brought him a shocking 6th round stoppage defeat in March and he needed time off because of damaged ribs.He was not ready to defend his title until October when he outpointed Cisco Andrade. 5th as Brown’s jabs took him clear over the first two thirds of the fight.Although Charnley finished strongly, experts such as Frank Butler and the Associated Press had Brown in front at the end. However boxing News and harry Carpenter, in the daily Mail had made the Englishman the winner. The crowd jeered and voiced their disapproval and the complaints went on for so log that when the ring announcer, Johnny Best, wanted to introduce the next bout the boos drowned him out. Whatever the rights and wrongs of the decision “Old Bones” returned to New Orleans with his title intact. It was fairly clear however that his time was running out. His last successful defence , his 11th, was a points win over 27 yr old Filipino Bert Somodio in front of 30,000 fans in Quezon City which is on the outskirts of Manila in October 1961. Brown floored the tough but limited Somodio twice and won a unanimous decision. In April 1962 it was all over for the champion as Carlos Ortiz the clever young Puerto Rican outboxed him and outsped him in Las Vegas, winning clearly on points over 15 boring rounds. Sadly Brown claimed in his old age that not only did he lose his world title but he also received not a penny of the supposed $75,000 payday. Four months after the Ortiz fight brown lost on points to Louis Molina in San Jose an the decline really set in. In Feb 1963 his deterioration was clear for all to see when Charnley knocked him out in the 6th round at Belle Vue, Manchester. As the years past brown lost the money he had made , partly because of his own inability to handle money and partly due to those around him who were adept at losing money which belonged to others. His business ventures failed, his marriage failed, and as boxing was all he knew he carried on slugging away on the circuit for the rest of the 1960’s. The defeats began to climb as he fought anywhere for a payday. By 1967 he had settled back in New Orleans and had more success even though he was passed 40 years old. He had one last fight in 1969, a 10 round draw with Steve Freeman and his last was in Tucson, Arizona in April 1970. The ex champ outpointed Ramon Flores, a novice of some 4 and 6 round bouts. SOMEONE HAD BEEN KIND TO THE OLD TIMER. When he retired Brown was forced to take jobs wherever he could and among other things he was a security guard and a bartender. In old age he was broke and being cared for by his half sister Geraldine.. He died of prostate cancer in New Orleans on 21 November 1997 aged 71. Rest in piece.